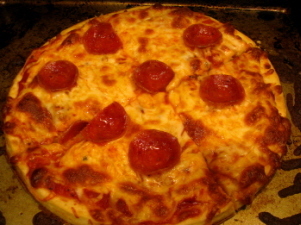 A Boboli pizza crust is an easy option for a quick, delicious pizza. Try a Boboli pizza today! Looking for a quick and easy pizza? Get yourself a Boboli pizza, your favorite pizza sauce (you can buy Boboli's pizza sauce which is pretty good), your favorite toppings and, voila! You have yourself a quick and easy pizza. 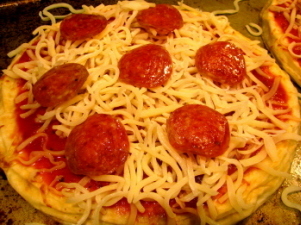 When I want a quick, delicious pizza, I often make a Boboli pizza. There's no pre-baking and no fuss. In fact, when we have kiddos over, we buy a few Boboli crusts and let each one make their own personalized pizza. It's fun for them and affordable for us grown-ups. Right now, you can get Boboli in an original crust, thin crust or whole wheat thin crust, all in a 12" size. You can also get mini-size crust for a small, personal pizza (great option for kids!). We'd love to see Boboli expand their product line by adding new crust options such as a cheese crust, stuffed crust, garlic-flavored crust, etc. Some fun flavors to mix it up a bit would be good - but they do have the basics covered. How does the Boboli crust measure up in terms of fat and calories? Let's take a look. All nutritional information taken from Boboli's website. All three pizza crusts are all pretty good options if you are watching your fat and calorie intake. Surprisingly, the Original crust has the lowest fat and calories per slice, but all of them are fairly low in fat. Keep in mind, this is just the crust and doesn't include sauce, cheese and other toppings...but in general, you're off to a decent start with a Boboli crust. You have one easy, delicious pizza!